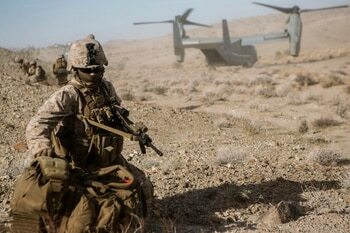 That was the phrase used recently by Royal Marines describing a training evolution aboard Twentynine Palms, California — where British and American Marines were pitted against each other in a mock fight. British tactical armored vehicles carrying mortar teams and commandos scoured the California desert landscape as they battled against American Marines, Harriers and drones. The two groups of Marines share a common heritage dating back to the early Continental Marines, and over the past 20 years have spilled blood together as ­partners on battlefields in Iraq and Afghanistan. But there’s always been the sense of a professional rivalry between the two maritime forces on who’s truly the most elite, and fittest, of the two services. Now, the American Marines are looking to their fellow brothers and sisters across the pond for advice on overhauling their own fitness program — as an internal debate rages in the Corps on the best way to mold troops for combat: strength and short bursts of speed or muscular endurance and agility? Over the past several years the Corps has been sending Marines to partake in or observe Royal Marine commando fitness training routines to better gauge changes to the Corps’ own fitness regimen and Force Fitness Instructor, or FFI, program. Marine Corps Times has obtained several ­after-action reports spanning 2016–2018 that detail an internal debate among the Corps’ fitness gurus on the best way to build a Corps that can better ­withstand the physical rigors of combat. Some of the after-action reports have made their way to the assistant commandant’s office, the sergeant major of the Marine Corps and the Force Fitness Division, highlighting the level of importance the Corps has placed on feedback and knowledge coming from lessons learned at the Royal Marine Commando course. Staff Sgt. 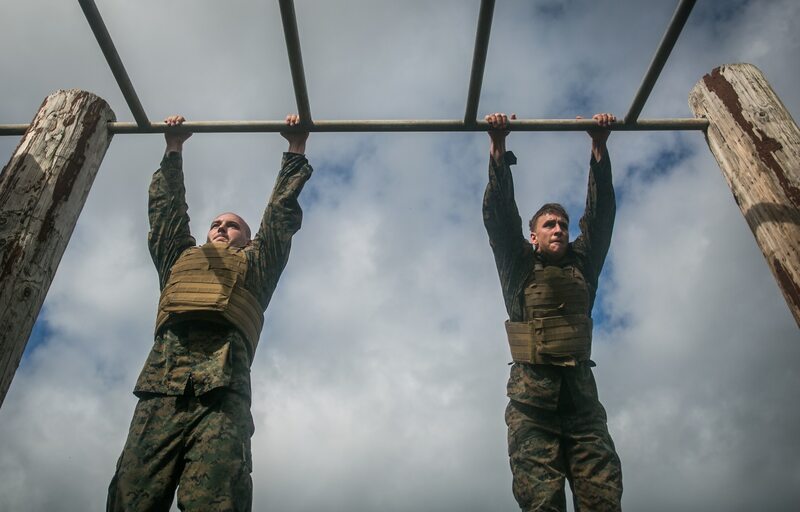 Richie Salinas and Staff Sgt Ray Anatoly, two American Marine FFIs, were among the first wave of U.S. Marines to fully attend the commando’s elite 17-week Physical Training Instructor program, or PTI. Their advice to the Corps: It’s time to overhaul its fitness program. They say it would be better to move the Corps’ culture, which is overly focused on strength training and college athletics, to a regimen focused on sustainable fitness that involves body weight exercises, routine assessments and builds muscular endurance and functional combat fitness. Salinas and Anatoly, in their after-action report to the Corps, also called for an overhaul of the Marines’ two annual fitness tests, the combat fitness test, or CFT, and the physical fitness test, or PFT. Specifically, the two Marine staff noncommissioned officers recommended the Marine Corps replace the PFT with the Royal Marine Commando Fitness Assessment, which commonly is referred to as the bleep or beep test. Their after-action report also called for the Corps to replace the CFT with a standardized timed obstacle course, and for the Marines to ­incorporate a Corps-wide practice of speed marches with 32-pound kits at a 10-minute mile pace. The commandant also has invited the Canadian Army, and expects the U.S. Army will want a sparring match. That’s not to say the FFI program does not teach these skills, but Anatoly and Salinas say the Corps’ fitness program needs a little more of a focus outside of the gym, with more real-world assessments to gauge overall fitness. The Corps’ FFI program is well-stacked with ­knowledgeable experts who are at the leading edge of sports science and injury prevention, but their program must take into mind the nearly 185,000 Marines, not all of whom are in combat-related occupations. Even small changes to a fitness program can have major consequences. The Royal Marines have a well-rounded ­program that has been around for over a decade, focused on ­academics, injury prevention, functional combat ­fitness and body weight exercises that are easily sustainable in any environment. The program also focuses on combat conditioning and obstacle courses and speed marches with kit and weapon. The commandos’ reputation garnered the interest of the Commandant of the Marine Corps, Gen. Robert B. Neller, who in 2016 visited the Royal Marines to observe their fitness efforts. “He and the Force Fitness Division team believe that there are, and will remain, many more opportunities to identify, assess, and adopt some best practices from other military units, sports teams, and athletic training communities to make Marines more fit, resilient, and prepared to accomplish the range of missions they are tasked to perform,” Lt. Col. Eric Dent, a spokesman for the commandant, told Marine Corps Times in an emailed statement. 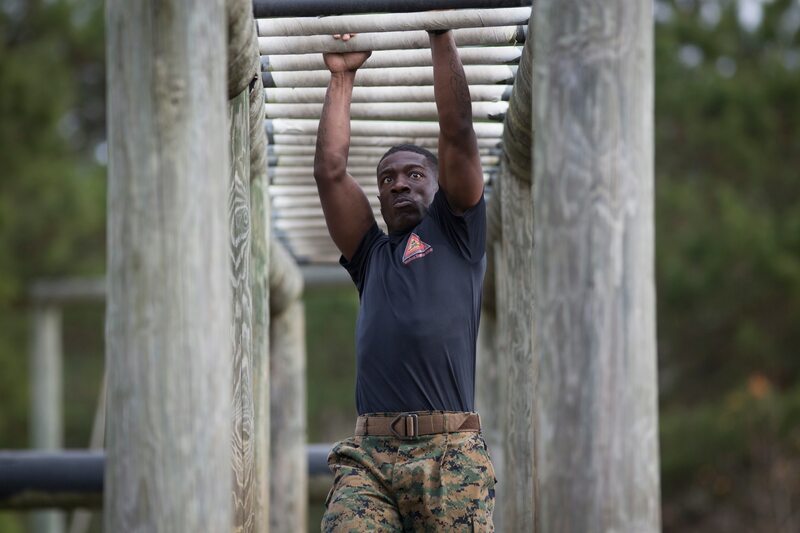 Moreover, the Corps has had an exchange program with the Royal Marines since at least 1972 to help lend expertise on fitness training at Marine Corps Officer Candidate School held aboard Quantico, Virginia. This program was started before the Corps launched its own fitness instructor course. “Since the inception of the FFI program, we have continued to look at the Royal Marines and the Royal Army for ideas on how to craft and tailor our FFI program,” Force Fitness Division and Training and Education Command told Marine Corps Times. To this day, OCS candidates are sometimes put through the Royal Marine bleep test, for general overall fitness, and not for score. The bleep test, sometimes called the beep test, is a fitness assessment for potential Royal Marine recruits. The test can identify fitness progression overtime and helps establish a fitness baseline for cardio, core and endurance. It’s an excruciating and arduous test, which took U.S. Marine Sgt. Armando Nava several months of cardio, planks and body-weight exercises to finally pass. “Very few people like to work with their own body weight,” Nava told Marine Corps Times. Nava says he took the test to challenge himself and his own fitness. He says the commando test isn’t necessarily more challenging than the CFT or PFT, though. The American fitness test focuses on strength building that requires gym exercises, while the commando test works a lot with body weight and endurance training, Nava explained. The test involves a shuttle run to help gauge VO2 max, which measures the amount of oxygen a person uses during an intense workout and provides an indication of potential physical aerobic endurance capability. The assessment test also includes press-ups or ­pushups, and also includes pullups and situps. For the situps portion of the test, candidates must keep their hands on their temples, knees together at all times, and elbows must touch the top of the knees. Each repetition is conducted at the sound of a beep, making it an intense test of muscular endurance and stamina. One after-action report reviewed by Marine Corps Times claimed this test is difficult to cheat on and “removes human error,” unlike the Marine Corps PFT, which involves “personal ­interpretation” of the movement. The beeps are key to the test and set the pace of the exercise. For pullups, when a beep is sounded, the candidate pulls up, then after the next beep they come back down. This causes the pullups portion to slow down, and causes a person to pause slightly at the top of the bar that they must hold until the next beep. The beeps also make the test easy to judge and administer. If a candidate isn’t keeping pace with the beeps and press-ups, it becomes fairly obvious to an instructor or observer. “If they miss the beep it’s pretty much stand up, you’re done,” Salinas explained, regarding the press-ups. Royal Marine recruits also do a timed 2.4-km squad run, nearly 1.5 miles, and a 2.4-km best effort run. United States Marines at OCS already perform the bleep test as a general part of fitness, and not for score. But, two Marine Corps after-action reports have put a lot of stock in this test. One report calls for the test to replace the PFT across the Corps, and another says at a minimum, the bleep test should be used as a baseline test for incoming Force Fitness Instructors in lieu of the PFT. Marine FFIs do run through the bleep test during the course, but Salinas says it’s not for score, just overall fitness. And while obstacle courses and speed marches with kit could be a better test of combat endurance than the CFT, it could prove to be a logistical and ­administrative nightmare. 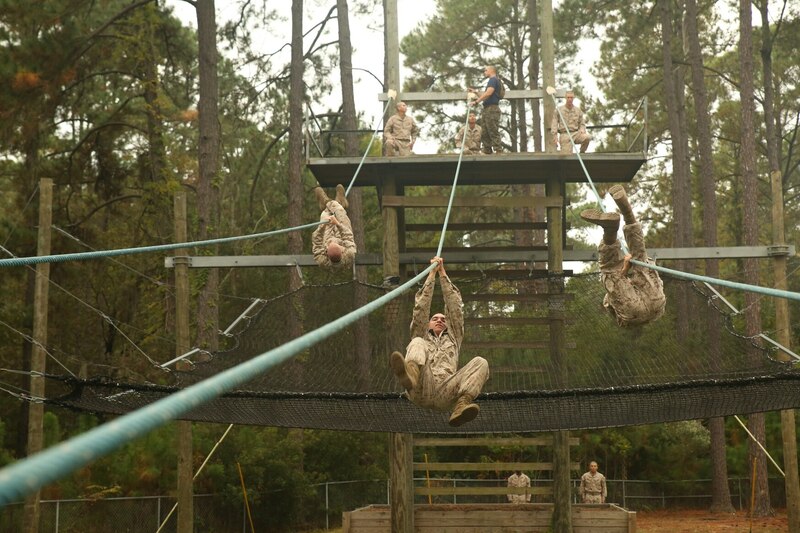 For one, the Corps would need to ensure it had a standardized obstacle course across the force. That also means potentially building new obstacle courses on joint military bases where a course might not be available, or transporting Marines to a base that has an obstacle course. There is also the potential for increased injury from such a rigorous fitness routine. However, one after-action report argues the Royal Marines use arduous fitness sessions to build stronger bodies and prevent injuries. But, what currently works for the Royal Marines may also be hard to replicate for the Marine Corps. They Royal Marines are only about 7,000 strong, making it a bit easier for PTI instructors to manage fitness routines across the force. The U.S. Marine Corps is nearly 185,000 strong. Brian Schilling, a professor of kinesiology and nutrition sciences at the University of Las Vegas, Nevada, said he agreed with a lot of the fitness recommendations in the after-action reports but took issue with a focus on body-weight exercises. “They are easier to do in large groups, but there is “body weight bias” that allows smaller, lighter Marines to perform better,” Schilling said. That bias goes away when Marines are wearing kit, he explained. 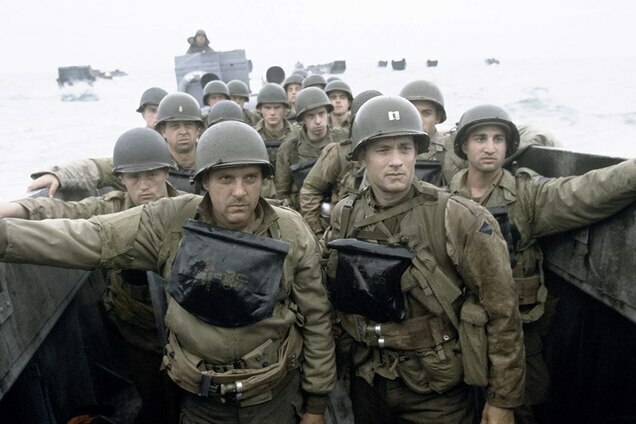 “We fight wars in kit, not in T-shirts,” Schilling said. But that criticism can be directed at the Corps too. Marines conduct both annual fitness tests without kit. 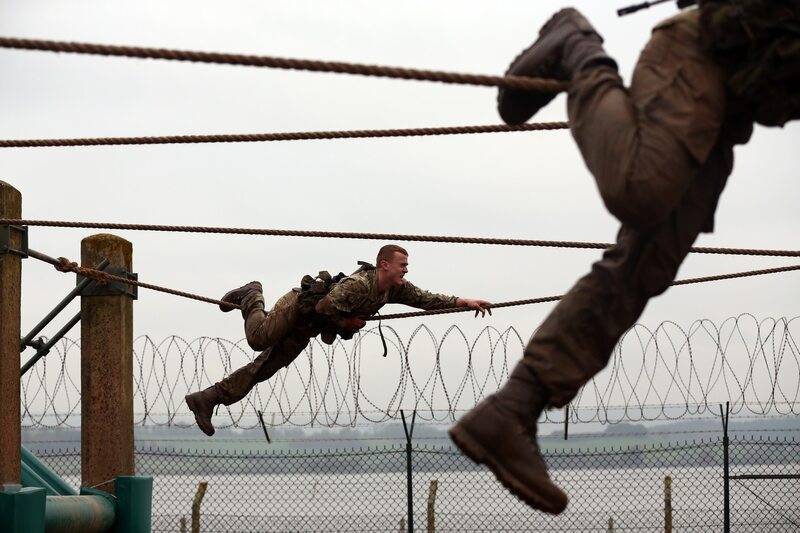 Royal Marines incorporate kit in many of the obstacle courses and marches they conduct, like the required timed assault obstacle course called Tarzan, or the Endurance Course, which is a 6-mile run that includes tunnels and obstacles, and a 9-mile and 30 mile speed march. All of these requirements are part of the commando phase of Royal Marine recruit training and require the candidates to carry 21 pounds of kit and rifle, weighing nearly 32 pounds total. American Marines do plenty of marches and at times obstacle courses in kit, but usually not for assessment. Though, newly initiated military occupational specialty, or MOS, qualification tests do assess some Marines’ fitness in full kit, especially for those headed into combat job fields like the infantry. Most of those tests assess short bursts of speed in kit, or fighting load. The after-action reports viewed by Marine Corps Times also called for a slew of changes to the FFI program to build more professional fitness instructors that could help change fitness across the Marines. Those recommendations include combining Marine Corps Instructors of Water Survival, martial arts instructors and FFIs into one primary job field. Royal Marine PTIs are the go-to instructors for everything fitness related for Royal Marine recruits in basic training to Royal Marines at the training centers. Their knowledge base includes injury prevention, to swimming, weightlifting and cardio. Royal Marine PTIs also get a slew of civilian credentials. Sub-courses at the PTI program include the British Weightlifting Association Level I, Assistant ­Swimming Instructor, National Pool Lifeguarding Qualification, Mountain Biking ­Level I and the Half Crown Boxing Coach from the Amateur Boxing Association. Currently the FFI program is only a secondary job field, but the Corps says it did consider making it a primary occupation. “When the Force Fitness Instructor (FFI) program was stood up, the initial thought was to model it after the Royal Marines program, and make the FFI a primary MOS [military occupational specialty]. It was determined that the number of FFIs required to adequately support the force was too large,” the Force Fitness Division and Training and Education Command said in a statement. Other recommendations focused on incorporating FFIs at the recruit depots, much like swim and martial arts instructors. There was also a recommendation to push FFIs to focus on circuit training over the card system. The circuit training system focuses on body-weight exercises and endurance, which ultimately requires few pieces of gym equipment. This makes fitness easier to sustain in the field over the card system, which often requires more gym equipment. The card system includes the workout listed on a card, hence the name. The Corps has sent several Marines to observe and participate in the Royal ­Marine PTI course, and while the Corps continues to look at the Royal Marines for fitness ideas, they haven’t quite overhauled the CFT or PFT just yet. But the Corps has certainly taken a lot of interest in the Royal Marine fitness program. The Force Fitness Division, under Col. Stephen Armes, has also made a slew of changes to fitness across the U.S. force. This year the CFT and PFT are getting a little harder as the Corps has increased maximum and minimum pullups for females and increased the minimum pass score to 150 on both tests. Another pending change to decrease rest time in between CFT events from five minutes to three has been put on pause as more research is done. The fitness division has also pushed healthier kitchen options at chow halls across the Corps, designed partially off of college athlete kitchens. 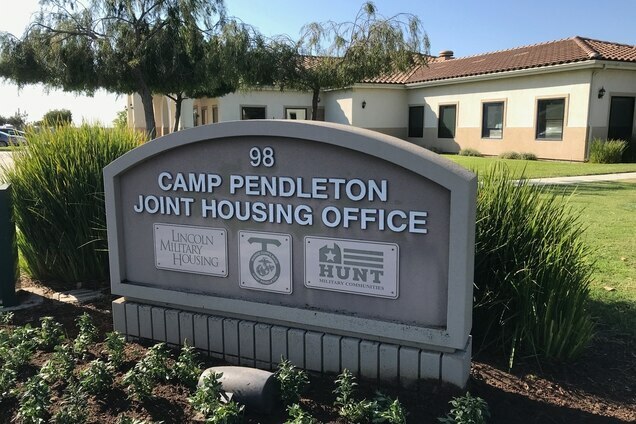 Those healthier chow halls started to hit the Corps in October 2018. New awards, to include Certificates of Commendation for those who get dual 300 maximum scores on both annual fitness tests are already being dished out. The Corps also wants to award the most fit battalion or 0–5 level command with the Superior Unit Fitness Award. The award is based on the top cumulative ­aggregate CFT and PFT score. A fitness phone app is also coming to help FFIs and Marines build balanced workouts and fitness routines that will help boost training but also prevent ­injuries. The Corps is also in the process of studying planks as an alternative to crunches on the PFT. Marines for ages have complained that the crunches portion of the PFT is too easy and susceptible to cheating. 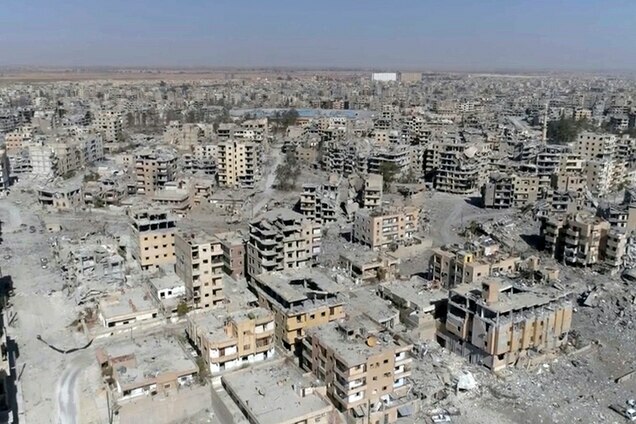 “There is no single military outfit, e.g. 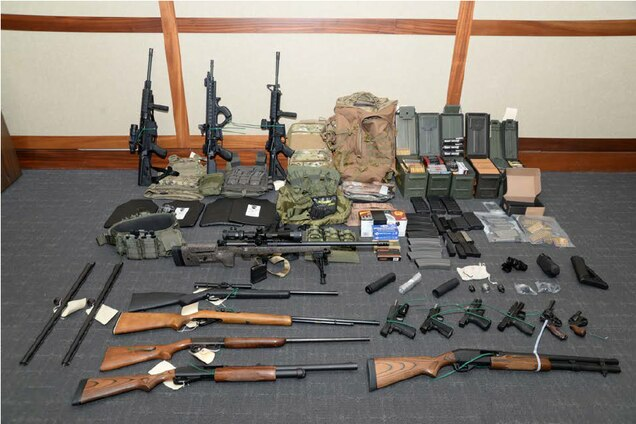 Royal Marines, MARSOC [Marine Forces Special Operations Command], etc. that has the market cornered on all the good ideas. Our FFD team, through research, outreach, professional ­exchanges and relationships, are in a unique position to determine which practices might have a positive impact on Marines,” Dent said.